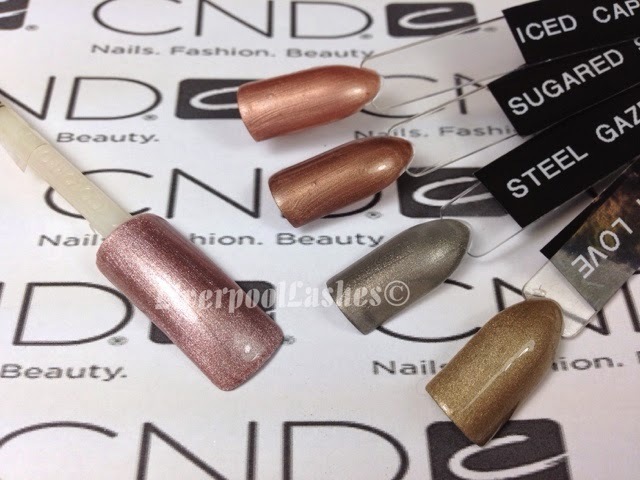 Today is finally the day that I can share with you all my thoughts on the new limited edition CND Gilded Dreams Collection Shellac, Vinylux & Additives! I posted my initial thoughts of the collection on the 1st September, click here to read it. I do have a full comparison video which you can watch here or at the end of this post. 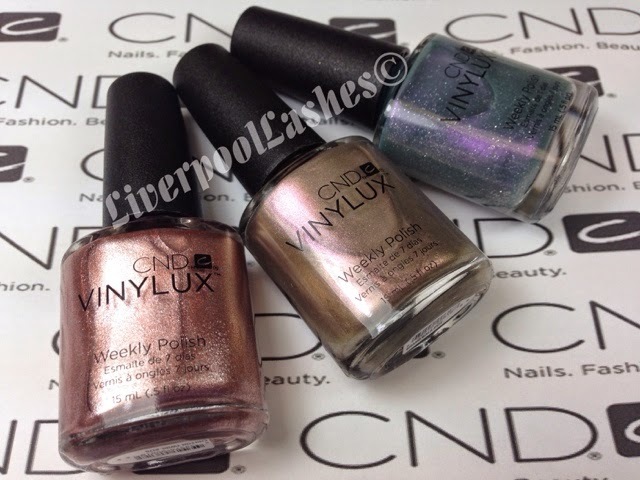 So here we are, above are the three limited edition shades in both CND Shellac and Vinylux. From left to right is Chiffon Twirl, Grand Gala and Dazzing Dance. 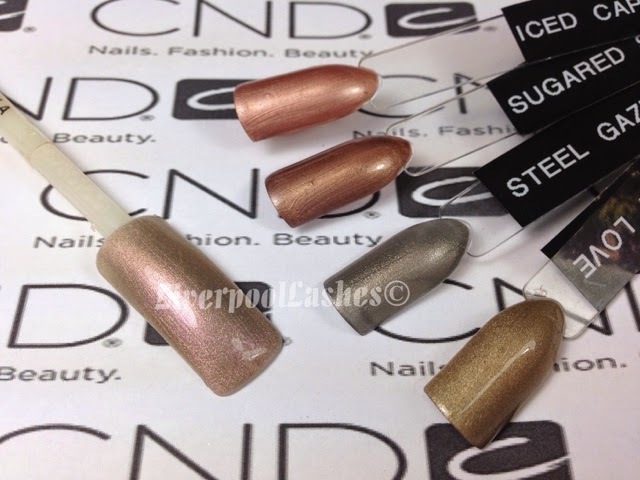 Each shade is available to purchase as a duo in both Shellac and Vinylux. I just love looking at these colours, I can literally imagine my clients being ecstatic when they see them and although could be perceived as festive, they're definitely not limited to any season. 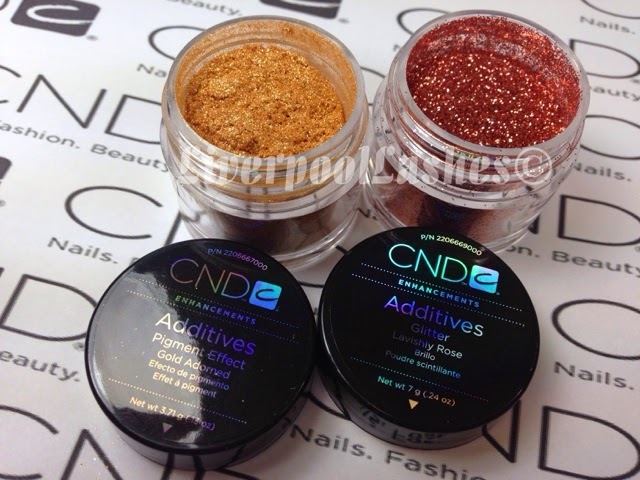 As part of the CND Gilded Dreams Collection there are four limited edition Additives that are sold together in an magnificent quad. From left to right on the photograph below is Gold adorned, Lavishly Rose, Pave Diamonds and Sapphire Hope. 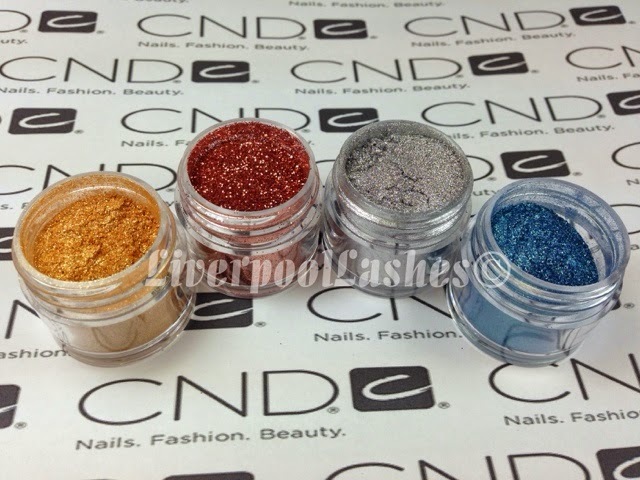 All are pigment effects apart from Lavishly Rose which is a truly stunning glitter. 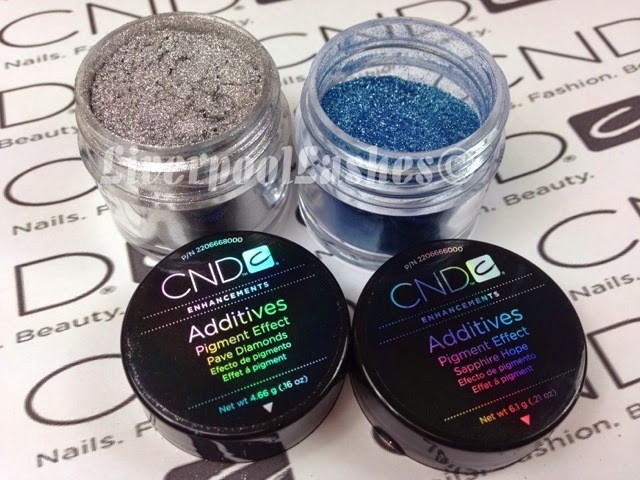 I thought I'd give you some juicy close ups of the Additives. I literally look at them and I can't wait to start playing with my colour pops, searching for new layering options. 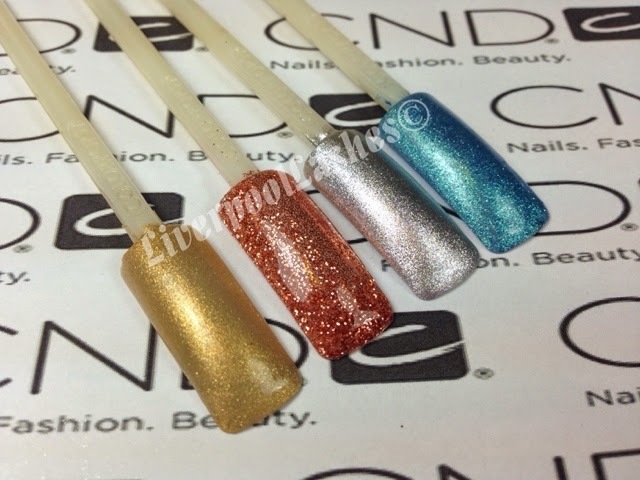 I often create a new fan for the latest collection and I will some my clients the new Shellac colours and Additives and then I will give them a whole host of combinations to choose from off that, they love it! I'll move onto the fun bit, the swatches. 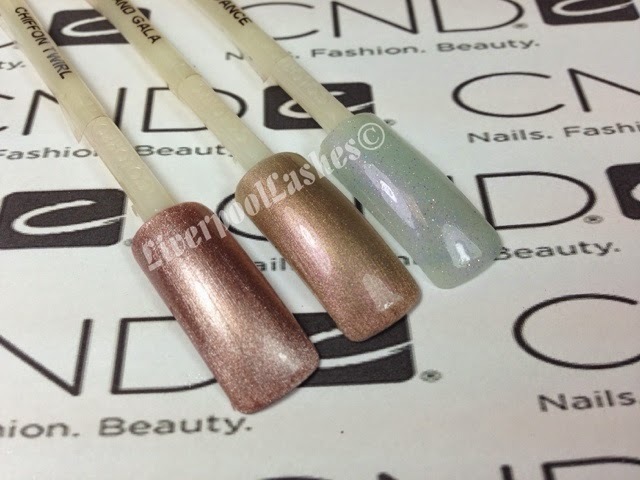 First up I'll show you the Shellac and Vinylux on a natural tip. Once again we have Chiffon Twirl, Grand Gala and Dazzling Dance. Chiffon Twirl is a true rose gold shade. Rose gold has been a highly fashionable colour for a while now with jewellery and accessories so this is a welcome edition to keep your clients nails on trend too. Below I have put it against all of the other close metallic shades, Iced Cappuccino, Sugared Spice, Steel Gaze and Locket Love so that you can get a feel for what the true colour is. Next up is Grand Gala which is going to surprise everyone! I know that everyone has probably assumed that it's similar to Locket Love! Well check out the photograph below! Grand Gala definitely belongs in the metallic family but has that hint of something special which is a opalescent effect. I would say it's really unusual and something that I would expect a high end brand to stock. Finally we have Dazzling Dance and of course, part of what I do is to preempt what the general public may think of the collection so I can do the relevant comparisons. There is no direct shade to compare with however, I did initially suspect that it might have been a merge between two discontinued shades (Moonlight & Roses and Mother Of Pearl) as it has a slight opalescent finish with a hint of shimmer but it does however also have a blue/grey hint to it. To test my theory I have applied Moonlight & Roses with Mother Of Pearl on a clear colour pop to show you. I'm so excited to apply Dazzling Dance over Azure Wish, I may play Disney's Frozen in the background as I do! Now onto the swatches of the Additives, brace yourself! These colour pops are natural and each additive is shown over Shellac Clearly Pink. 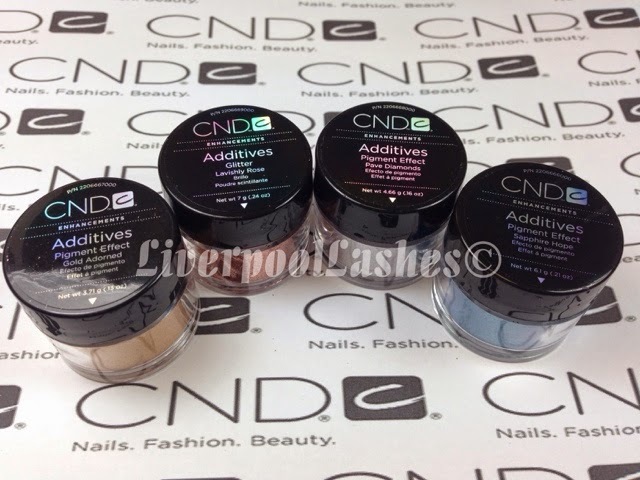 I'm literally not sure which colour to look at first but I'm sure you'll agree that you know a client that will pick each one of those or a combination of Additives and Shellac shades! I truly hope you've enjoyed your preview of this limited edition collection. This isn't a paid post, the colour pops and products were kindly provided by Creative Academy+ Manchester and Sweet Squared for you to dribble over. Please come and follow my Facebook Page for all of the latest information, nail ideas and tutorials! Enjoy my comparison video here!! I really enjoy these blogs/videos you do with the collections. So helpful! 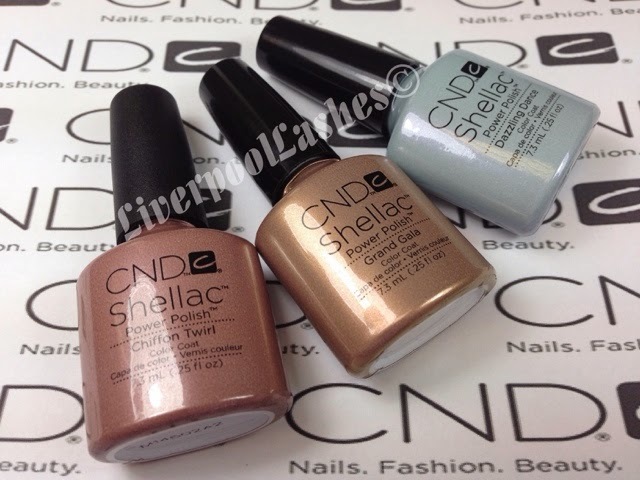 I'm a huge fan of Shellac and CND in general but this was the only collection i didn't get :( I only got Chiffon Twirl. 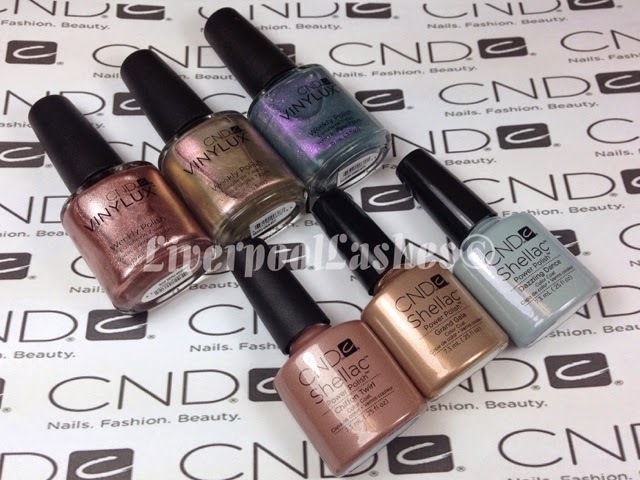 It's lovely in Vinylux and Shellac. The other 2 are too sheer. I know you can layer them but i hate applying 3 coats of Shellac. It starts looking bulky, soaks longer and it takes about 5 minutes extra. PS. 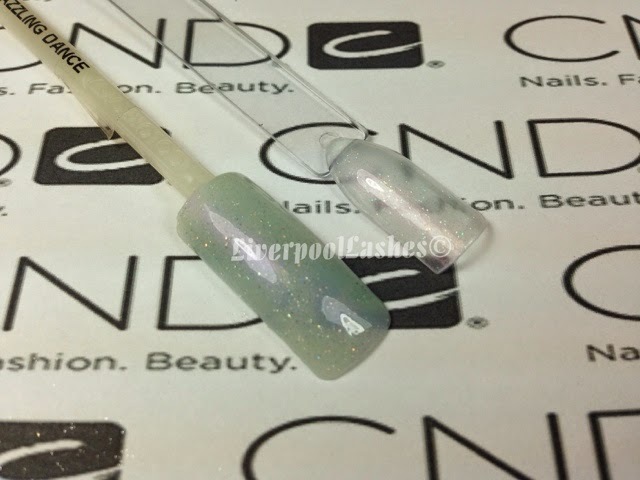 How much time do you book for a Re-Shellac Manicure?